ETM students at PS 169 in the Bronx and students from Zürich’s Sihlfeld school participated in a music and cultural exchange program attended by Ambassador André Schaller, Consul General of Switzerland in New York. “We are very happy to support this innovative, state-of-the-art musical exchange between American and Swiss students. It’s wonderful for me to see children from both sides of the Atlantic come together in such an inspiring way,” said Ambassador Schaller. The students performed for each other via Skype, followed by a question and answer session about school life, hobbies and experiences living in Zürich and New York. Members of the Swiss Consulate’s Culture and Education Department, Thomas Schneider, Swiss Head of Culture and Education, and Sandrine Ligabue, Deputy Head of Culture and Education, facilitated the exchange by translating the discussion in Swiss German and English. 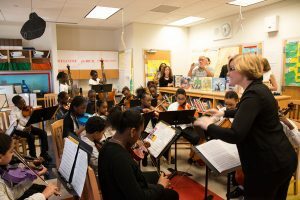 “We are thrilled that Education Through Music students and students in Switzerland are coming together to share their mutual love of music,” said Katherine Damkohler, Executive Director of Education Through Music.